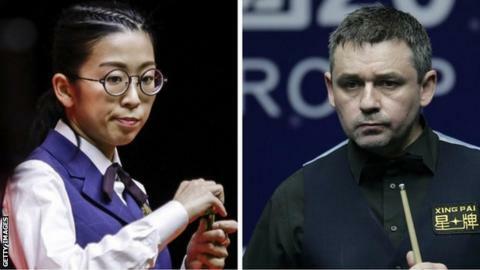 Scotland’s Alan McManus edged past women’s world number one Ng On-yee in the first round of the World Snooker Championship qualifiers. McManus, 48, a two-time Crucible semi-finalist, trailed 2-0 before the morning session finished tied 4-4. Hong Kong’s Ng, 28, has won the women’s world title for the past two years and edged ahead again, but McManus pulled clear to win 10-6 in Sheffield. England’s Reanne Evans, the only other woman playing, lost 10-2 to Zhang Yong. McManus’ compatriot Ross Muir was beaten 10-3 by England’s Tom Ford. The World Championship at the Crucible runs from 20 April to 6 May.